Our clients often try to push us to hire freelancers and remote developers to expand the team. Sometimes we agree, but more often – we actively resist the suggestion 🙂 This article will help us to understand various schemes of remote development and determine which schemes are efficient for different types of projects. The first step is to define the terms. 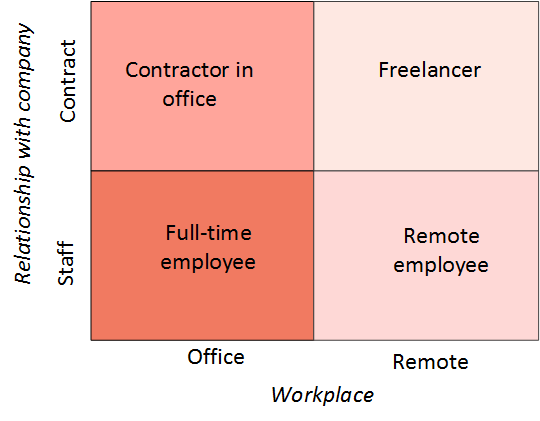 If we talk about physical location of employees and degree of their involvement in a project, there are two basic dichotomies: Contract vs Staff Employee and Office vs Remote Work.